Spring is here and the weather is getting warm. Its time to burn off that extra energy you have built up from being cooped up in your house all winter long. Get outside and use some of that extra energy to turn your backyard into a living space built for entertaining all summer long! Below are 3 inexpensive and awesome DIY home projects for backyards on a budget. Adding a bar to your outdoor living space creates an awesome focal point for your backyard entertainment. The convenience and uniqueness of your outdoor bar will have your friends loving your backyard gatherings. This is an easy DIY project that you can start and finish over a weekend for under $60! Learn how to build your own backyard bar with this easy DIY hack below! After a day of grilling with friends, there is nothing better than relaxing around a fire pit and enjoying the night. Building your own fire pit can be done in one day without spending a lot of money. Before you get started on this project, make sure you check your city’s ordinances on fire pits. The video below will walk you through how to safely take on this easy DIY project. We saved the best part for last! No backyard would be complete without the appropriate grill. So complete your backyard living area with a grill that can accommodate a bbq gathering of any size. Using this DIY hack to build your outdoor grill will cost your less than $100 and provides you the opportunity to add to your grilling options. Use safety precautions when building your grill and make sure you provide enough space between your grill and flammable structures. 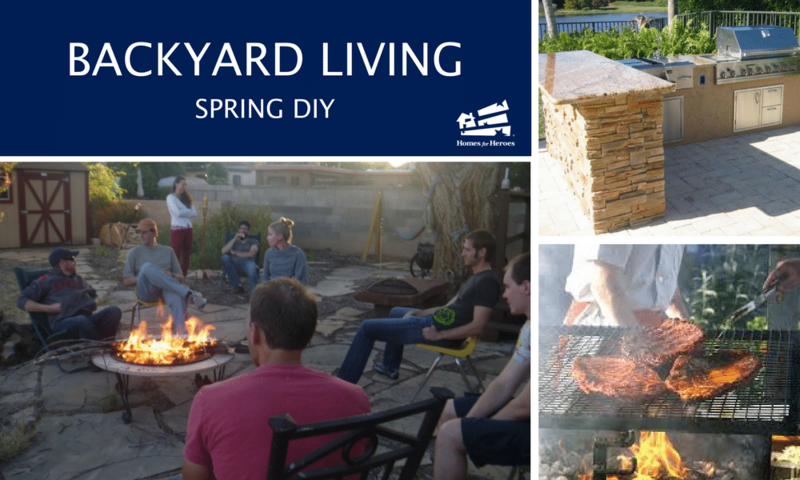 We hope enjoy these great DIY home projects for backyards that can save you money. If you have created the ultimate living area in your backyard, we would love to see it! Please comment below and add a picture of the ultimate backyard area you built! Firefighters, law enforcement, EMS, military (active, retired and veterans), healthcare workers and teachers save money when buying, selling or refinancing a home with Homes for Heroes. Sign up at HomesforHeroes.com to speak with a local real estate specialist in your area.